After a particularly arduous week (which you know has been tough when you’re using “week” to describe just Monday, Tuesday, and Wednesday) I don’t always feel like making something complicated, and I sometimes resort to ditalini. 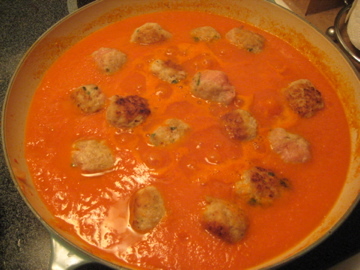 But last night I found a new comfort favorite, a recipe in America’s Test Kitchen for Tomato Soup with Meatballs and Pasta. 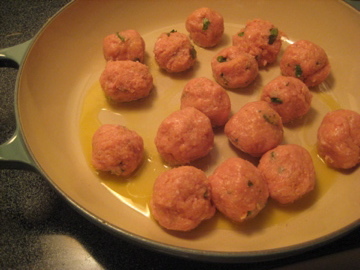 The recipe was in an issue focusing on “Light and Healthy” recipes- this meant the meatballs were supposed to be made of ground chicken mixed with just a few tablespoons of pesto, and poached instead of cooked with oil. Um, I’m Italian- we don’t poach meatballs. So I took some liberties with that part of the recipe – in keeping with the “healthy” theme, I used ground turkey- I just couldn’t bring myself to use chicken. I used Italian breadcrumbs instead of pesto, and I put an egg and some fresh chopped parsley in the mix. I pan-fried the meatballs in my new Le Creuset braiser (happy birthday to me! 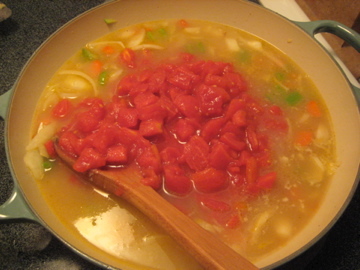 ), and cooked them the rest of the way in the soup. They were not the best meatballs I’ve ever made, but they were quick and healthier than my normal pork/veal/beef mixture. ….were all placed in a pot with a few swishes of olive oil, and sautéed for 8 minutes. Then, I pureed the sauce in my food processor. My processor is pretty small so I had to do this in several batches, and frankly a big, powerful blender would have been better and led to a smoother sauce- but I kind of liked the texture mine ended up with. I adjusted the salt in the sauce at this point, and added the meatballs back in. I simmered the sauce for another 20 minutes, and added some small pasta. 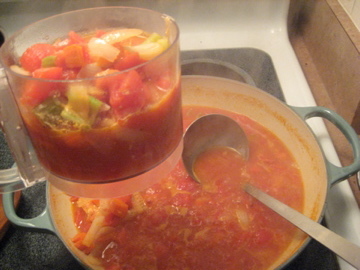 The whole thing took about 45 minutes, but it wasn’t complicated cooking and the final soup was rich and comforting. The recipe made quite a bit of food, so you could feed four at once or have plenty of leftovers. I’m definitely making this again. sounds delish. when you add the pasta…has it already been cooked? yup, in this recipe the pasta is already cooked. if you wanted to use a very small noodle, like pastina or acine de pepe, you could cook it in the soup itself. just remember that cooking pasta in the soup soaks up a fair amount of liquid.